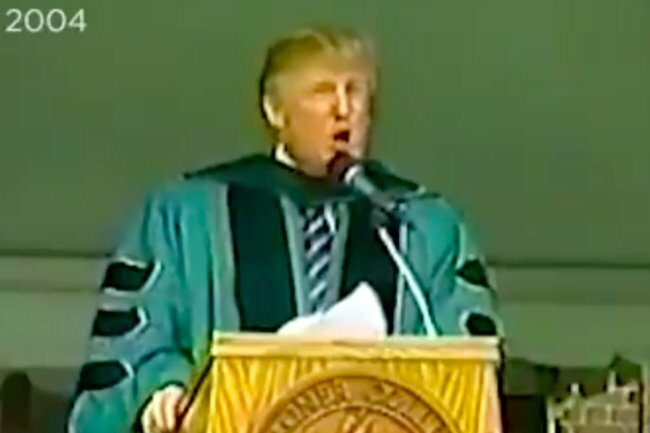 The Donald Trump wall speech from 2004 that is going viral. The 12 painfully ironic words Donald Trump said in 2004 that sort of ruin... everything. Donald Trump wants to build a wall. In fact, the US government is entering the third week of a shut down, on the back of intense discussions about the wall. The 72-year-old US president even wants to declare a national emergency, in order to build this wall. But all this talk about the wall jogged some people’s memory. On Twitter, The Daily Show with Trevor Noah has reminded the world of 12 words Donald Trump uttered in an inspirational speech back in 2004. He was attending Wagner College’s commencement ceremony to receive an honorary doctorate of letters… and this is not good news for his “wall”. Moments into the address, Trump encouraged the audience to never ever give up. Then he chose to use a metaphor that in 2019, he’s bound to regret. Oh. That is some brilliant advice for the Mexican people he is trying to keep out. “Go over it, go around it, but get to the other side of that wall,” he continued. That is… great advice, actually. Naturally, the people of Twitter are obsessed. It’s not a concrete wall??? ?, it’s big??? ?, beautiful??? ?, see-through steel barrier???????? Oh please how can we send this to someone at the border? Others wondered who on earth gave that man a degree in the first place and, same. At 22 days, the shutdown in the United States is the longest ever recorded. Perhaps this video will inspire a change of heart?